"The digital revolution's first era failed to solve pressing social, economic and environmental challenges. Blockchain offers a once-in-a-generation opportunity to get it right. Blockchain: Transforming Your Business and Our World skillfully champions the opportunities offered by a new Internet of value." 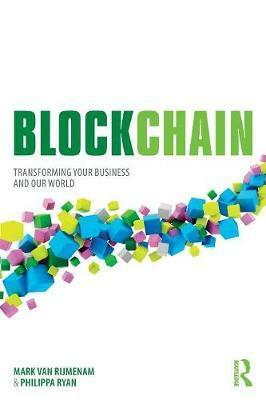 "So much more than JABB (Just Another Blockchain Book). Van Rijmenam & Ryan take you on a tour of the world's potential with the blockchain trust protocol and its ability to change our world. When you're done reading this book, you'll be sketching the art of the possible ... not dreaming about it. Trust is a competitive advantage. You earn it in droplets and lose it in buckets. Van Rijmenam & Ryan turn the typical boring blockchain book upside and create a journey on how trust can change our world. More so, the book makes you dream big - not just about the changes that are coming - but ones that you can participate in or imagine on your own. Never really had a "Must Read 2018 Books" list ... until now." "Blockchain's potential is so much more than digital currency. Blockchain: Transforming Your Business and Our World is a step towards bringing that potential to life, exploring positive use cases and practical solutions to a diverse range of global social issues, from climate change and healthcare access to digital identity and poverty. For anyone interested in how we can build a better world with blockchain technology, this book provides an educational snapshot into what a more decentralized future could look like."